Manchester Bombing Is Europe's 13th Terrorist Attack Since 2015 : Parallels The post-concert bombing is the 13th terrorist attack in Western Europe in a little over two years. This coincides with the rise of the Islamic State, which has been linked to most all the attacks. 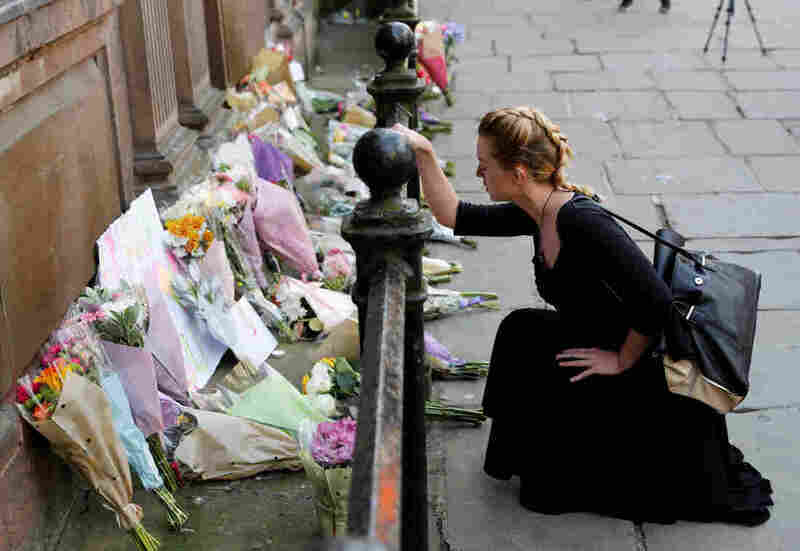 A woman lays flowers for the victims of the Manchester Arena attack in central Manchester, England, on Tuesday. The Manchester bombing is the 13th terrorist attack in Western Europe since the beginning of 2015. Collectively, they have claimed more than 300 lives. ISIS has been linked to most of the attacks, and on Tuesday, claimed responsibility for the concert bombing. By comparison, the United States has suffered fewer than 10 deadly terrorist attacks, with fewer than 100 deaths, since the Sept. 11, 2001, attacks. ISIS makes no secret of its desire to hit Europe. Its online magazine, previously named Dabiq after a town in Syria, is now called Rumiyah, or Rome. That's because the group wants to eventually seize Rome, as the symbolic home of the pope and Christianity. "We will not rest from our jihad except beneath the olive trees of Rome," says the quotation under the magazine's title. It's attributed to Abu Hamzah al-Muhajir, one of the group's leaders, who was killed in Iraq in 2010. After surging across large swaths of Syria and Iraq in 2013 and 2014, ISIS declared a caliphate, an Islamic nation, in the territory it controlled. Since then, it has been pushed back in its core territory by the U.S. air campaign and by allied forces on the ground. But it has managed to claim terror attacks far from its base. "The global reach of ISIS right now remains is largely intact, despite the extremely effective work that has been done to degrade ISIS in its caliphate," Nicholas Rasmussen, head of the U.S. National Counterterrorism Center, said earlier this month in Washington. 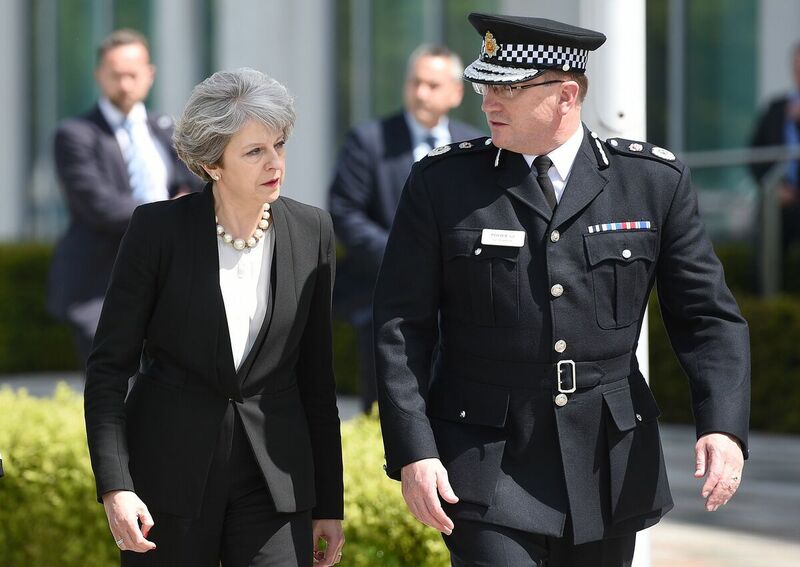 Britain's Prime Minister Theresa May walks with Chief Constable of Greater Manchester Police Ian Hopkins as she arrives at the force's headquarters in Manchester on Tuesday following a deadly terrorist attack the night before. ISIS claimed responsibility for the Manchester bombing via the group's Amaq media channel, the same way it has announced attacks in the past. British authorities say a suicide bomber set off his explosive in the entrance hall of the arena as the crowd was leaving the concert by American pop star Ariana Grande. The ISIS statement does not mention a suicide attacker, but says one of its "soldiers" placed a bomb at the arena. The European spree began in France, when a gunman went on a shooting rampage on Jan. 8, 2015, at the Paris offices of the satirical magazine Charlie Hebdo. The attack killed 17 people. The steady stream of assaults has included large-scale attacks orchestrated in great detail by ISIS, like coordinated shootings and bombings in Paris in November 2015 that left 130 dead. There have also been individual attacks, like one in March by a driver who plowed into pedestrians on London's Westminster Bridge and then began stabbing people as he tried to enter the British Parliament grounds. ISIS claimed responsibility for that attack, though British authorities have said they believe the man was acting alone and it's not clear whether he had any links to the group. Five of the dozen European attacks since 2105 have been carried out by gunmen, vehicles have been used four times and bombs were detonated in three instances. With the smaller scale attacks carried out by individuals, government officials and counterterrorism analysts say it can be difficult to determine the exact links, if any, between an attacker and ISIS. An attacker may simply be a long-distance admirer inspired by the ISIS call to strike in its name. Analysts say it's also possible that ISIS may claim some attacks — even if had no knowledge of them — to suggest an ability to hit far and wide. Also, government officials and analysts say that as ISIS continues to lose ground in its core areas of Iraq and Syria, the group is likely to place even greater emphasis on attacks further afield in an attempt to show its relevance. Thousands of European Muslims went to fight for ISIS and security officials have been concerned that they will return home and try to carry out attacks. Rasmussen, the U.S. official, says this remains a big worry, though the thinking is evolving. "Intelligence agencies were initially concerned about the sheer numbers of ISIS returning home," he said. "But now the focus is on what's expected to be a small number who have skills to recruit or carry out sophisticated attacks." ISIS is struggling to hold on to parts of western Mosul in northern Iraq, the last urban area where the group has a foothold in that country. In Syria, the U.S. and its partners have been advancing toward Raqqa, the de facto ISIS capital in the north-central part of the country. Even if ISIS is driven from the territory it controls, the group is expected to carry out guerrilla-style attacks in both Syria and Iraq, as well as terrorist strikes elsewhere.